One of the persistent problems in TV anime production is the tendency for shows to start off strong and end disappointingly. Frequent culprits include inconclusive or unsatisfying endings, visible decline in animation quality as a series reaches its conclusion, or a lack of clear direction after a certain point (usually midway). Once upon a time, there was one studio particularly emblematic of this trend, and its name was Gonzo. To my surprise, Gonzo appeared in the news in 2016 because of its purchase by Japanese ad agency Asatsu-DK. The path for Gonzo back to stability and relative prominence is an interesting one, and while I don’t have the inner details of just how Gonzo accomplished this, I want to discuss from my own fan perspective the ups and downs of Gonzo over the past 15+ years. Back in the early 2000s, Gonzo shows would hit the ground running. Series such as Kiddy Grade, Vandread, and Last Exile, were full of attractive and memorable characters, and their action scenes were rife with flash and pizazz. Gonzo had two main strengths. First, was the quality of their animation. Second, was that their shows often looked visually “cutting edge.” Just as the turn of the 21st century carried with it the last vestiges of the 20th century hope for a world of flying cars and such, so too did Gonzo shows have a futuristic feel. In my own view, no studio embodied the essence of the period’s anime more than Gonzo, especially when factoring in their prominence on American store shelves, and their work on Afro Samurai. A quick glance at their releases shows just what was fundamentally wrong with Gonzo: they bit off more than they could possibly chew. For years, multiple shows of theirs came out practically every season, and each time they all but repeated the same mistake of starting strong and ending weak. Just about every series clearly went over both time and monetary budgets for the sake of style. Perhaps the lowest point of Gonzo’s existence came in 2009, when Gonzo began animating the yuri mahjong series Saki. About two-thirds of the way through, they could no longer keep up production, and they were replaced by a studio called Picture Magic. From there, they began to fade into obscurity, working only on smaller projects usually at the behest of other companies. However, this might have well been what saved them from the brink. Gonzo’s problem was that they were always good at micro elements such as action scenes, but faltered with macro elements like overall story and pacing. But when they could serve the role of just helping others with action, they could shine. Notably, when the Street Fighter IV expansion Super Street Fighter IV came out in 2010, they replaced the more artsy and avant garde Studio 4ºC as the provider of 2D-animated cut scenes for the famous fighting game series. Studio 4ºC has many strengths, mostly in terms of its creativity and willingness to push the boundaries of abstraction in animated works, but conventional portrayal of fight scenes was not in their wheelhouse and it showed. For Gonzo, on the other hand, it was a perfect fit. Since then, they’ve come back to directly producing works, such as Last Exile: Fam the Silver Wing in 2011 and the Bayonetta anime in 2013. When you look at Gonzo’s output now, it’s clear that their approach has changed. Where once they tried to cram six or seven shows into a single year, now it’s generally one or two. If they’re working on more shows, it’s usually in conjunction with other studios, such as with Thermae Romae in 2012. For better or worse, they’re not even as focused on action, as their recent works tend to be more comedic, most notably the recent 2015 show Seiyu‘s Life. All the while, they still assist other studios. Perhaps what Gonzo needed was experience, going from the wild abandon of their proverbial youth to something much more reserved. In some ways, I miss aspects of the old Gonzo. In particular, I was fond of how they often strove to be ahead of their time, even if it didn’t bear any fruit and also tanked their earnings in the process. 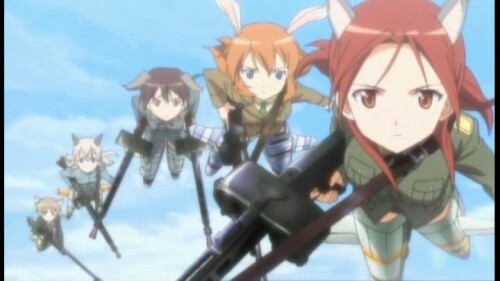 Back when Strike Witches first aired, obtaining anime was very different. There was no Crunchyroll for legal streaming. DVDs were much more expensive than blu-rays are today. Torrents dominated, but even sharing over IRC and DC++ still happened to a small degree. In this environment, Gonzo said that they would distribute Strike Witches, episode by episode, DRM-free, and at a fairly decent video quality. Gonzo tried to legitimize online anime viewing at a time when it was seen as impractical or even impossible, and were among the first to jump on board with the revamped Crunchyroll—a site that had gone from piracy central to forging legitimate relationships with Japan. But if it’s the difference between going out in a blaze of glory and charred bills or keeping their heads above water and slowly paddling along, then I think it’s better for Gonzo’s sake that they’ve changed. Maybe once they find themselves on terra firma, they can unleash the passion of their youth once again. This entry was posted in anime, trends and tagged gonzo. Bookmark the permalink. Fantastic post. I’ve been meaning to watch more Gonzo shows out of interest. With the older ones I’ve seen being NHK and Full Metal Panic. As for newer shows, I watched the first episode of Akiba’s Trip, and I gotta say the actions scenes were fantastic. Beyond that, their catalog is rather untouched for me. SIDE NOTE: I wonder how it would be if Bee Train came back nowadays and attempted to revert their old mistakes.